The parish of Twyford sits astride the A1067 Norwich to Fakenham road just south-east of Guist. It is a tiny hamlet consisting of a scatter of houses and almost an extention of nearby Bintree. The main feature of the parish is Twyford Hall and its estate lying to the north of the main road, the present houses and farm mainly lie to the south. 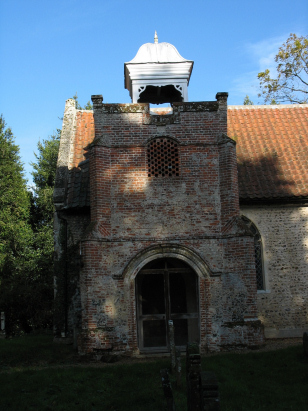 St Nicholas church is easily overlooked when passing along the main road, its site masked by dense woodland. St Nicholas is obviously an estate church lying as it does in the Hall's acreage to the north of the A1067. 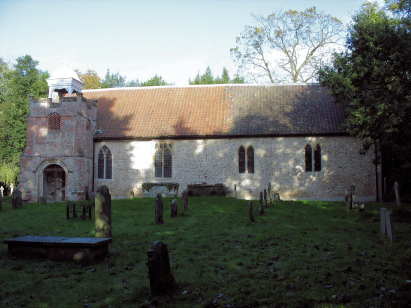 The church is early with Norman features that date to the 12th and 13th centuries. With fast moving traffic so close it remains a haven of tranquility and shelter. The baptismal register covering the period is a very recent deposit with Norfolk Record Office and is filmed on Microfilm MF/RO661 from which this transcript was prepared. This film benefits greatly from modern filming techniques being clear and with excellent contrast.